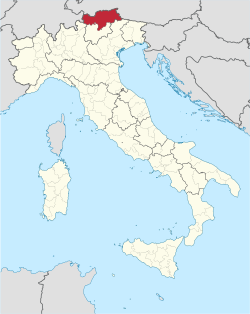 South Tyrol (German: Südtirol, Italian: Sudtirolo) is an autonomous province in northern Italy. It is also known by its Italian name Alto Adige. Together with the province of Trento, it makes up the region of Trentino-Alto Adige/Südtirol. The province has an area of 7,400 square kilometres (2,857 sq mi). About 511,750 people live there (2011). The capital of the province is the city of Bolzano. South Tyrol borders Graubünden and Lombardia in the west, Tyrol and Salzburg in the north, Trentino and Veneto in the south. Although it is part of Italy, most of the population speaks German. Around a quarter of the population speak Italian, most of whom live in the two largest cities (Bolzano and Merano). Italian and German are both official languages. In parts of the province, a third language, Ladin, is spoken and official as well. South Tyrol is the most common name for the province in ancient English. German and Ladin speakers usually refer to the area as Südtirol. The official name is the Province of Bolzano (in Italian: Provincia autonoma di Bolzano – Alto Adige; in German: Autonome Provinz Bozen – Südtirol; in Ladin: Provinzia autonoma de Balsan/Bulsan – Südtirol). South Tyrol/Alto Adige is an autonomous province. It has its own legislature that makes many laws that are separate from those made by the Italian government. Luis Durnwalder has been the head of government since 1989. He belongs to the South Tyrolean People's Party, which has been governing since 1948. The name Alto Adige comes from the river Adige. "Alto" means upper, because the upper part of the river flows through the province. The name was first created by the Napoleonic French to distinguish (point out: difference) this Italian-speaking area from the Austrian empire's Tyrol, directly north. Between the Renaissance and the 19th century, the whole area, originally populated only by Latins from the time of Roman Empire, experienced a lot of Germanisation. In the centuries before Napoleon, only the Dolomite's area of the western part of the present area of South Tyrol (especially the Val Venosta near Merano) remained neolatin. Austria controlled the territory under the name of South Tyrol until 1918, performing a complete Germanisation policy after the wars of the Italian independence. After the First World War, despite the fact that its inhabitants were almost entirely German-speaking, South Tyrol was assigned to the Kingdom of Italy by the Treaty of Saint-Germain. This happened on the basis of the wishes of the Italian irredentists, who considered the Alto Adige as a geographical territory of Italy and based this on the fact that originally the territory had been mostly of "Ladin language" until the fourteenth century. Besides, the fascist government favoured the industrialisation of the province to attract Italian immigrants: as a result of this "Italianisation", today 135,000 people (almost a third of the total population) use Italian as mother tongue. The ruling political party in South Tyrol is the "Südtiroler Volkspartei", which has had an absolute majority since 1947 because of the large amount of German speakers. Just after World War II about 65% of the population spoke German as their mother tongue, about a third spoke Italian, and about five percent spoke the Ladin language. In the 2011 census the percentages were: 63%, 23% and 4% (another 10% are immigrants from outside Italy). ↑ Cf. for instance Antony E. Alcock, The History of the South Tyrol Question, London: Michael Joseph, 1970; Rolf Steininger, South Tyrol: A Minority Conflict of the Twentieth Century, New Brunswick, New Jersey: Transaction Publishers, 2003. ↑ "The South Tyrol Success Story: Italy's German-Speaking Province Escapes the Crisis". 2010-08-25. Retrieved 2012-11-24. Luis Durnwalder... has been president of South Tyrol since 1989....[and] Durnwalder's party, the South Tyrolean People's Party (SVP), ...has ruled the province with an absolute or relative majority since 1948. This page was last changed on 13 February 2019, at 16:00.